The Florida Keys are without a doubt one of the best locations to go to for a shot at catching a world class tarpon either with light tackle spin fishing gear or using a fly rod. Geographically located just perfect between the Atlantic Ocean and the Gulf of Mexico the Florida Keys are right in line with the yearly tarpon migration. 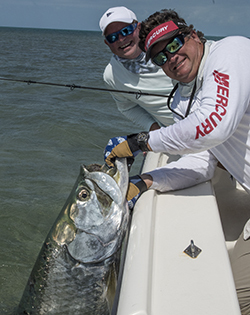 Fishing the flats, channels, bridges or harbors for tarpon, our guides do it all from Key Largo to Key West out to the Marquesas Keys. Fly fishing or spin fishing are the way to go for tarpon fishing in the Florida Keys. Our tarpon fishing guides are all seasoned veterans. Schedules fill up fast so booking ahead is a great idea. A non edible and somewhat protected species of fish, the tarpon is sought after by anglers all over the world for their amazing stamina and high flying tactics when hooked up. Some of our tarpon weigh as much as 175lbs with an average size being 60 - 90lbs in season. A single tarpon experience can last well over an hour from hook up to release depending on the size of the fish and experience of the angler. 4, 6, and 8 hour trips are available every day during tarpon fishing season on any different type of trip you would like to go on. There are many variables to these fishing charters. We use flats boats that carry 2 or less, bay boats that carry 4 or less and larger center consoles that can carry up to 6 persons. Rates start at 450 for a half day for 2 persons. Calling us to see what variables will make you happiest is key. No experience is necessary to go tarpon fishing unless fly fishing or sight fishing for them on the flats. Live baiting, bridge or harbor fishing is the easiest way to fish for them and offers the most hook up chances. 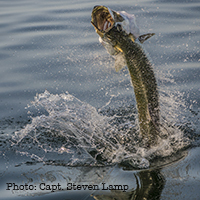 Booking ahead for tarpon season is critical. The months of April, May and June get sold out for many of our more experienced tarpon guides and charters. To make a tarpon fishing reservation the best thing to do is call us directly. There are many variables in this type of fishing charter and by interviewing you over the phone we can set you up the right way with the right boat and guide in a location near where you will be staying. We are always here standing by to help you put your Florida Keys fishing charter together.